Looking for deals in Dresden? This 5-star-superior hotel offers elegant rooms with free Wi-Fi, a 1312 ft² day spa and the Michelin-star Caroussel restaurant. Fantastic hotel. Great staff. Located within the grounds of the 18th century Schloß Pillnitz palace, this privately run hotel enjoys a beautiful setting by the river Elbe, surrounded by picturesque vineyards and fruit orchards. Exceptionally clean room and helpful staff. This completely renovated pet-friendly hotel features a new modern-baroque design. 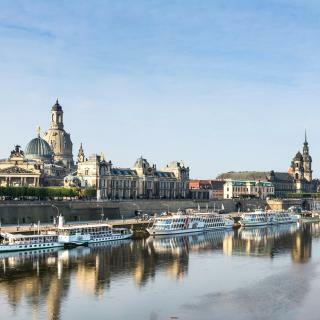 The center of Dresden, featuring sights such as the Frauenkirche Church, is a 10-minute walk away. The property, location, and staff were amazing. This hotel is located on the Neumarkt square in the heart of Dresden's Old Town district. Good location and very helpful staff! This hotel is quietly located in green countryside, 1.2 mi from Dresden Airport. It is a direct 20-minute tram ride from Dresden’s Old Town. It offers free parking. The hotel was incredible comfort and the staff was more then i expect, warm and professional. This stylish boutique hotel is located between the Kraftwerk Mitte cultural area and Dresden’s world-famous Baroque attractions. It offers free high-speed WiFi, a fitness room and a 24-hour reception.... The Hotel is great. We arrived at night - no problem since the desk is attended 24 hrs. Located in a 400-year-old building beside the River Elbe in East Dresden, this family-run hotel offers free Wi-Fi and an Italian restaurant with river views. The property is very quaint and cozy. This hotel is located in the Baroque heart of Dresden, directly opposite the Zwinger Palace. It offers a 24-hour fitness studio and a sauna. The location was excellent for exploring on foot. The staff was very friendly and helpful. This nonsmoking hotel is located in the heart of Dresden, a 5-minute walk from the Zwinger Palace, Semper Opera and Frauenkirche Church. The ibis Budget offers free Wi-Fi and a 24-hour reception. This is one of the BEST budget hotels in the world that we have been in and the best in Germany. 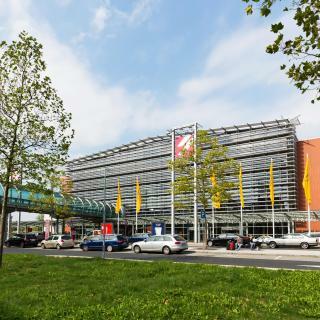 This hotel is a 5-minute walk from Dresden’s Congress Center and a 12-minute walk from the Old Town district. B&B Hotel Dresden offers free Wi-Fi and free parking. Staff was friendly and helpful. It was walking distance to everything we wanted to see. Located in Dresden's Old Town, the Heinrich-Schütz-Residenz offers a chargeable spa area and free WiFi. It is close to the Frauenkirche church and a 5-minute walk from the Zwinger palace. This is an outstanding apartment , with all fantastic amenities. This hotel is located in the city center, just a few steps away from the Semper Opera House and Dresden's historic Old Town district. It's perfect luxurious hotel on the banks of river. Located opposite the Japanese Palace in the Neustadt district of Dresden, this design budget hotel offers free WiFI and a 24-hour reception and bar. It was such a pleasure to stay here. Everything from checkin to checkout. Just 2297 feet from the Großer Garten Park and 1.2 mi from the Old Town, this 4-star hotel in the Striesen district of Dresden offers spacious rooms and an Argentinien steakhouse. Staff were very friendly and accommodating. Also, a family friendly location. Elegant rooms and a classical-style restaurant with conservatory and terrace are featured at this centrally located hotel, just a 5-minute walk from Dresden-Neustadt Train Station and the historic Old... Very nice front desk staff and dining room staff. Very clean. Attractively decorated. Located directly opposite Dresden Central Station, this hotel offers soundproofed rooms with flat-screen TV, traditional Saxon cuisine, and free Wi-Fi access up to 1 MB/s. Very close to main station. Staff very helpful. Which hotels in Dresden have nice views? Hotel Villa Sorgenfrei & Restaurant Atelier Sanssouci, Star Inn Hotel Premium Dresden im Haus Altmarkt, by Quality, and Kim Hotel Im Park got great room view-related reviews from travelers in Dresden. How much is a hotel in Dresden for tonight? On average, it costs $69 per night to book a 3-star hotel in Dresden for tonight. You'll pay around $92 if you choose to stay in a 4-star hotel tonight, while a 5-star hotel in Dresden will cost around $127, on average (based on Booking.com prices). Which hotels in Dresden are good for couples? These hotels in Dresden are highly rated by couples: Relais & Châteaux Bülow Palais, Romantik Hotel Bülow Residenz, and Heinrich Schütz Residenz. How much does it cost to stay in a hotel in Dresden? On average, 3-star hotels in Dresden cost $103 per night, and 4-star hotels in Dresden are $136 per night. If you're looking for something really special, a 5-star hotel in Dresden can be found for $188 per night, on average (based on Booking.com prices). Which hotels are the best ones to stay at in Dresden? Hyperion Hotel Dresden Am Schloss, Hotel Suitess, and Star Inn Hotel Premium Dresden im Haus Altmarkt, by Quality are some of the popular hotels in Dresden. Which neighborhood is the best one to stay at in Dresden? Altstadt, Neustadt, and Pieschen are popular with other travelers visiting Dresden. Which hotels in Dresden are good for families? 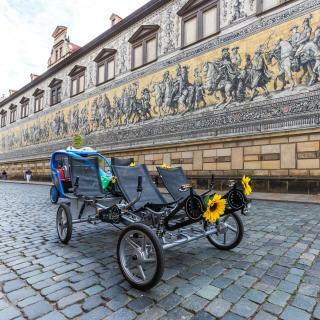 Many families visiting Dresden loved staying at Heinrich Schütz Residenz, Star Inn Hotel Premium Dresden im Haus Altmarkt, by Quality, and Relais & Châteaux Bülow Palais. Which hotels in Dresden offer an especially good breakfast? For hotels in Dresden that serve highly-rated breakfasts, try Hotel Smetana, Hotel Villa Sorgenfrei & Restaurant Atelier Sanssouci, and Relais & Châteaux Bülow Palais. What are the best hotels in Dresden near Klotzsche Airport? Travelers who stayed in Dresden near Klotzsche Airport (DRS) have said good things about DORMERO Hotel Dresden Airport, Novum Hotel Dresden Airport, and Hotel - Restaurant Kurhaus Klotzsche. How much is a hotel in Dresden for this weekend? The average price per night for a 3-star hotel in Dresden this weekend is $146 or, for a 4-star hotel, $180. Looking for something even fancier? 5-star hotels in Dresden for this weekend cost around $272 per night, on average (based on Booking.com prices). 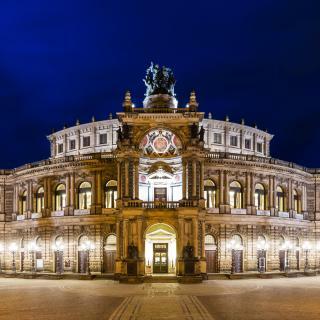 What are the best hotels in Dresden near The Semperoper? Some of the best hotels in Dresden near The Semperoper include Schone Wohnung am Dresdner Zwinger, Hyperion Hotel Dresden Am Schloss and Heinrich Schütz Residenz. 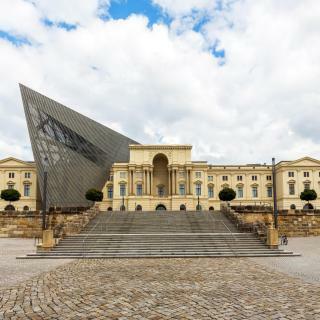 Located on the banks of the Elbe River, the whole city was destroyed during World War II, but has now been rebuilt into one of the most interesting places in Europe. Like a phoenix from the ashes, the Church of Our Lady (Frauenkirche) is an imposing building that is one of the most beloved symbols of the city. 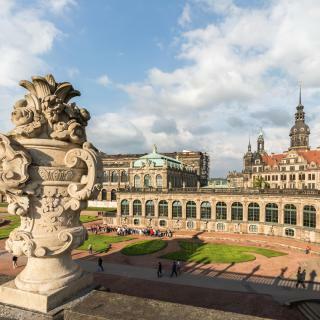 Magnificent Zwinger Palace is the main Dresden attraction, featuring impressive pavilions and a majestic garden in the middle. Continue your journey along the cultural centre of Germany and visit the picturesque Baroque square of Neumarkt. Also not to be missed is Brühl Terrace, a promenade nicknamed the "Balcony of Europe", for its excellent view of the River Elbe. Enjoy a relaxing stroll around the city and you will find a selection of cozy Dresden restaurants and beer gardens serving local dishes and fine wines from the surrounding vineyards. Dresden Airport is the international airport located in the district of Klotzsche, featuring a railway station in the terminal building. Take the train and head to your Booking.com hotel, guesthouse or apartment. Dresden was a good surprise for us. Dresden was a good surprise for us. We live in Germany, so we thought we knew what to expect here. This is different than other German cities, in a good way! We found it warm and inviting, and it had a more international flavor. There are many beautiful sights and we had a wonderful time here! 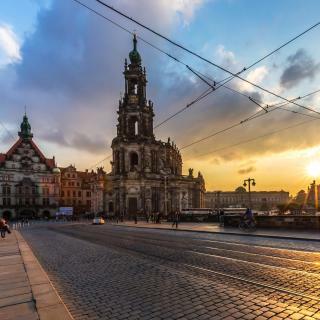 Dresden is an amazing town for walking around, visiting cultural attraction, listening to international street musicians which know how to make the best of the towns acoustics. Take a bike and follow the river on a sunny day it is brilliant. The town has a lot of flair but also quite ugly industrials areas. So stay close to the river and you will be immersed and feel the realities of the baroque area as if it were yesterday. A photographer’s dream! Few German cities are as beautiful as Dresden, plus it has loads of character. Whether you’re visiting the Baroque sights of the old town, the college-community vibe of the Neustadt, or the modern shopping and eating areas around the train station, there’s a lot to offer in an easy-to-navigate area. 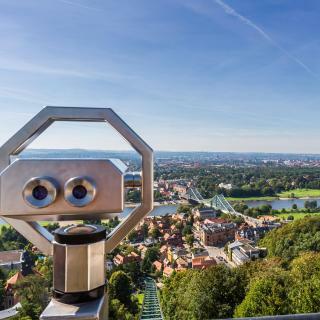 Dresden also serves as a great base for exploring many other cool places in Saxony such as the Saxon Switzerland, the Wes Anderson-inspiring town of Görlitz, or the culture-rich town of Leipzig. It’s also a good waypoint if you’re coming from or going to Berlin or Prague. Old sites and museums are very good. Old sites and museums are very good. Trip too short (and winter weather too cold and windy) to walk around in city north of the river. Recommended to go up that way, but not readily doable in a two day winter visit. Dresden is of course a historic German town worth visiting once, but I can't say I was overwhelmed or particularly enjoyed my one night stay. I was especially disappointed with the attitude in service in the touristy areas in the center, especially knowing how warm and friendly it can be in other parts of Germany. Still, it was worth seeing an Eastern city for a change and the evening walk was very nice in the town. It was a great hotel right in the heart of Dresden. We went to Dresden to see the sites, but also for the Christmas markets, we couldn't have picked a better place. It was cheaper than the nearby places, but hood quality. A big shout-out to the man who checked us in. I am sorry we didn't get his name. But he was kind and warned us that restaurants aren't open Christmas Eve and told us which hotels we could get a dinner reservation so we did not get stuck with McDonald's, or nothing. Thanks!! I love such hotels. Big, old, a lot of wood and stone. And though it's not new and fresh it offers great accommodation in a special atmosphere. Hotel offers good health center - gym is small and not well equipped but pool, sauna etc. are really perfect. You can swim at 6 am with a beautiful view to Dresden center. Breakfasts are good and the restaurant also has a bellevue. Staff is helpful and friendly, lots of amenities are provided for free. The hotel is really ok and budget for young people, really close to city centre via Elbe embankment for some 10mins walk, because Dresden in a really nice little town. The rooms are clean, the cleaning regular, hot water and heating functioning, pillows really big and comfortable, TV with 100 programmes. In a nutshell, I really liked it. How not to love everything in this place? From the people kindness to the charm of the place. We have been traveling across Belgium, the Netherlands, Denmark and Germany, though we encounter most of the time kind people and great places, nothing compares to Klosterhof. All what they do is genuinely meant to please their guests. Thr hotel is very classy and its location is fantastic, just near Zwinger and very close to old town (just around 500 meters). The standart double rooms are quite large even with an extra bed and quite enough. The beds and the armchairs are comfortable. This hotel is the best if you are looking for something in city centre. We were lucky and they found also space in garage for us. Room is just right, no fridge or wardrobe but for short stay is lovely place. We do like also the style of one motel hotels. The hotel was right beside the schloss in the old town and an easy walk to all the major sights in Dresden. The hotel appeared old from the cobble stone road but was sleek and modern when I stepped through the door. I felt very safe in the area. Nice hotel. Comfortable rooms and bed. Basic but did the job for a couple of nights stay in dresden. Good location. Nice and handy for the train station but a bit of a hike (or tram) if youre intending going to the old town. Location for the Christmas market was excellent. The facilities were absolutely top notch. One of the best hotels for the money that we have experienced in Germany. Highly recommend. This is a modern and comfortable hotel with a great location that is walking distance to most of the top destinations in Dresden, and to lots of good restaurants and bakeries. I liked their location so you can walk to famous places of Dresden. While you stay this hotel its feel like home, they have a small kitchen for you making food also. Everything. Quick check-in. Proximity to the train station and to the city center. Best hotel in dresden.